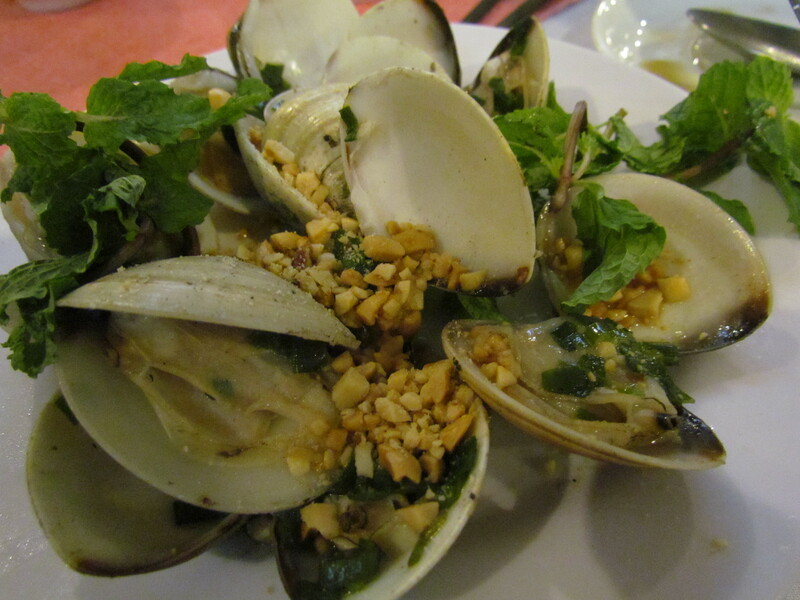 This is the last of the series of YUMMRAJ eating out in Vietnam. 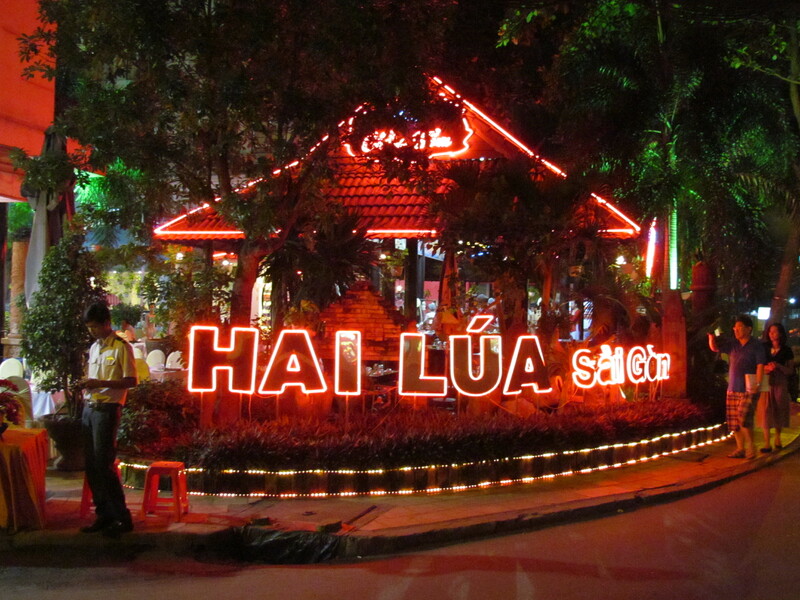 This is about two our dinner at Ha Lua – this was a massive two storied building with a open air area, a partially covered area, a fully covered dining Hall & also special AC dining rooms for hosting parties for 8 – 10 people. 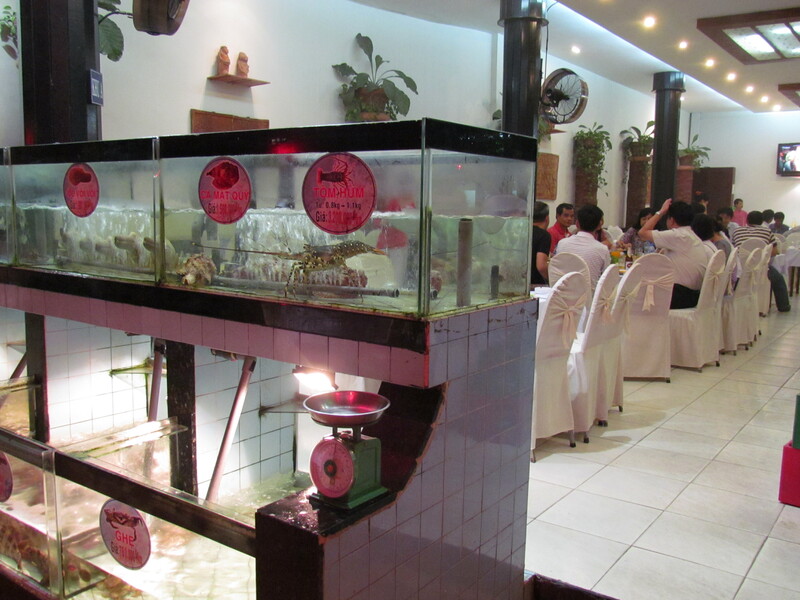 I do not remember seeing such scale in any restaurant in India. Right at the entrance to the place there are two things that no Indian can miss – one a live open air roasting station for small pigs. I do not imagine this happening in India the next 30 years as well. The other thing was mammoth glass aquariums with unlimited & many unknown sea animals in them. You choose ur animal & that will be cooked for u. The servers were all dressed in traditional Vietnamese dress. Hardly anyone spoke English. So we were communicating to each other like Barfi. We were a group of ten people & happened to try quite a lot of different food. I am merely describing the same with not too many names around. 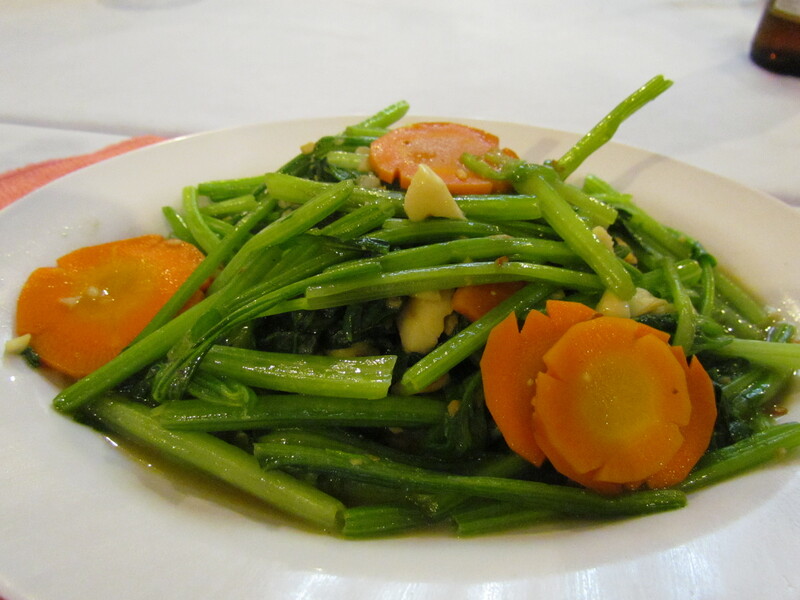 The simple stir fry of veggies was so good to start with. 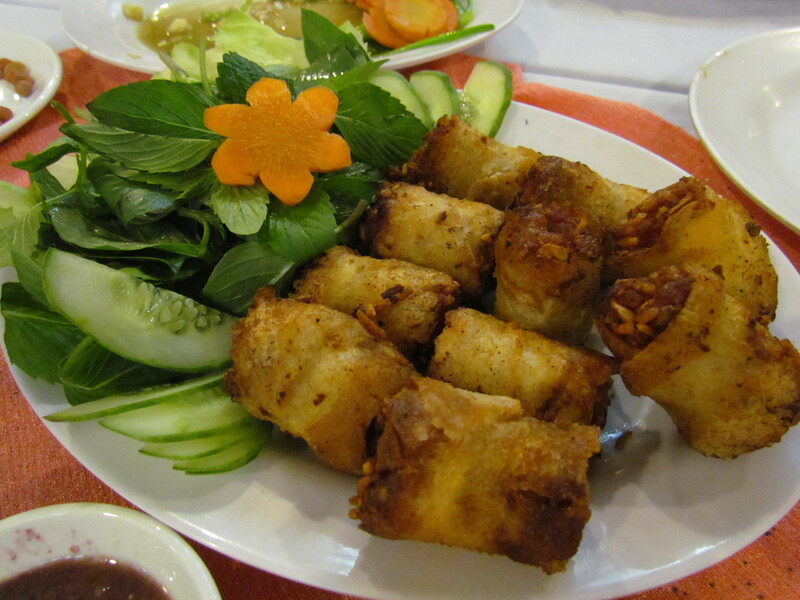 So was the Vietnamese deep fried beef spring rolls. Intense , juicy & super tasty within & crispy flaky & layery outside. I have never come across such good springs rolls in India before. 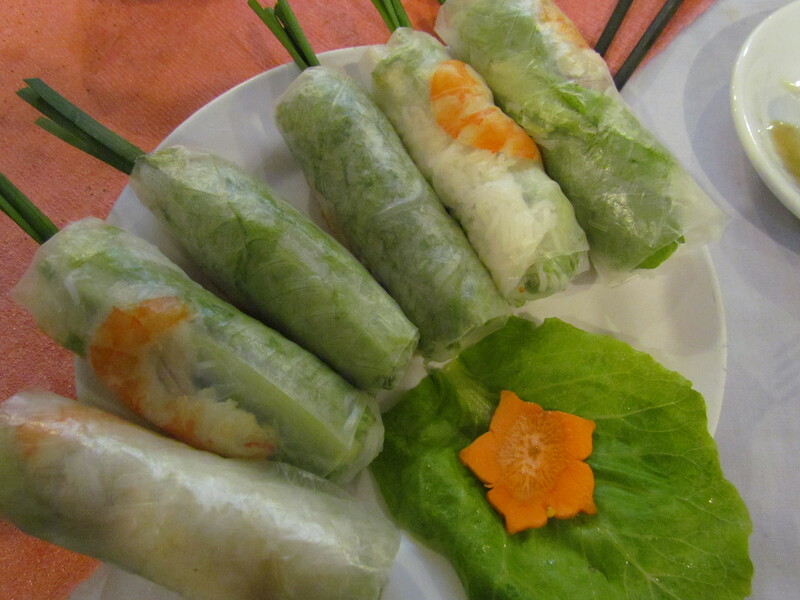 We also tried the thin translucent wrapped roll that I had tried earlier at Wrap & roll. 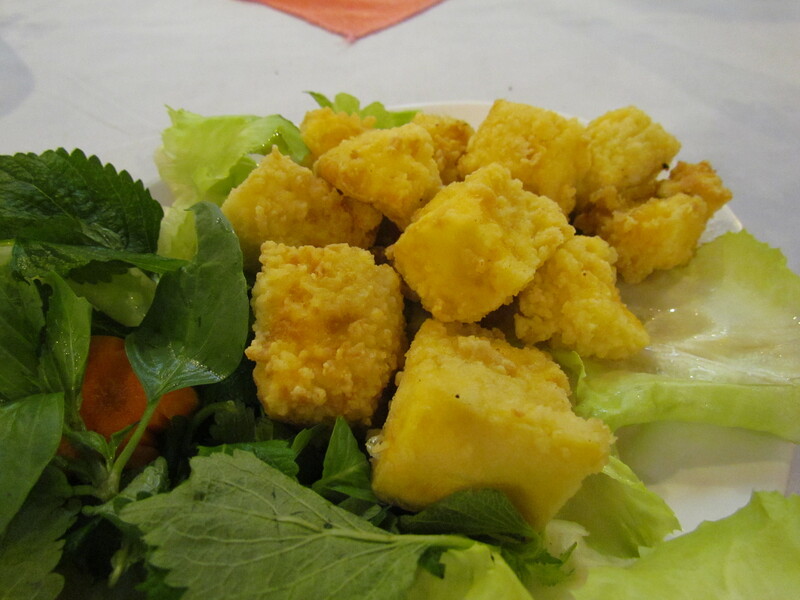 Crumb fried tofu was interesting but I did not find it wow. 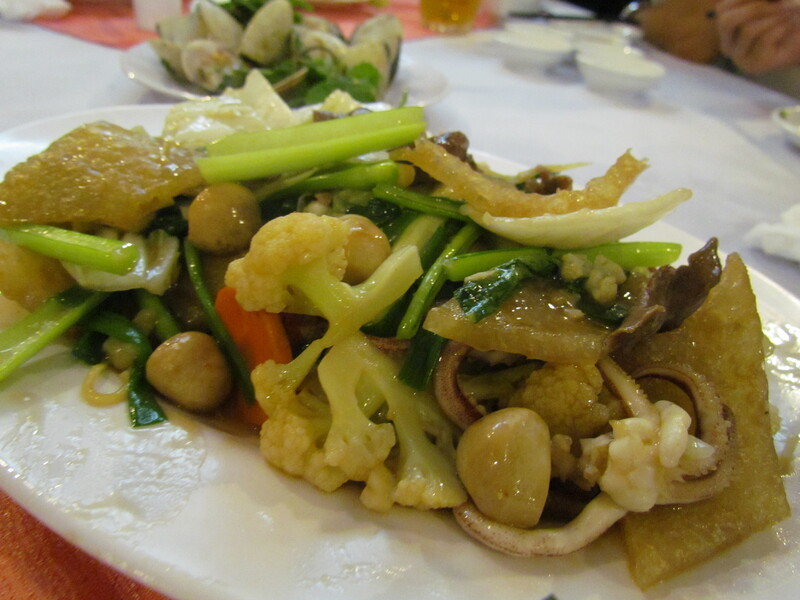 The garlic shell fish was superb – a tiny portion of meat that u have to wriggle out of the shell fish , along with the burnt garlic was just too good. 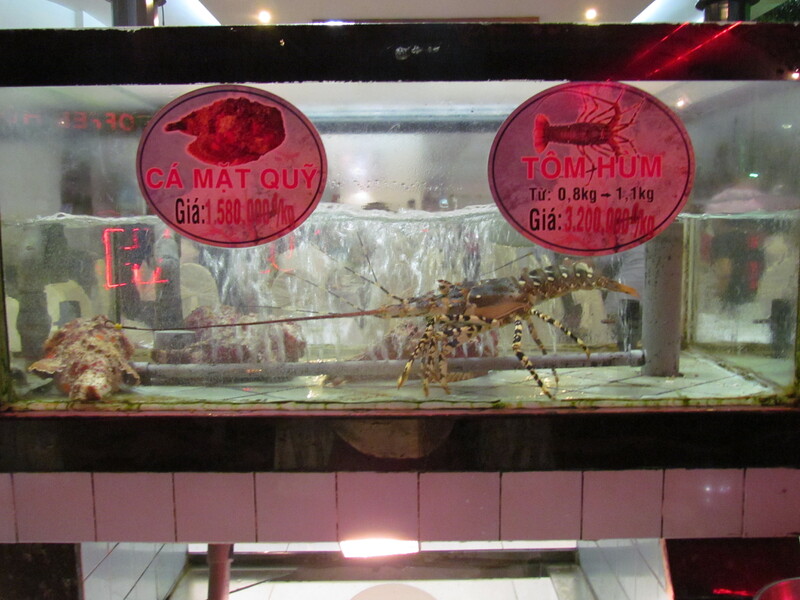 Mixed seafood & veggies was so new to me that after a minute I stopped asking which is what. I just ate a bunch of stuff with different taste & textures. The only thing I cud identify was octopus. Loved it. 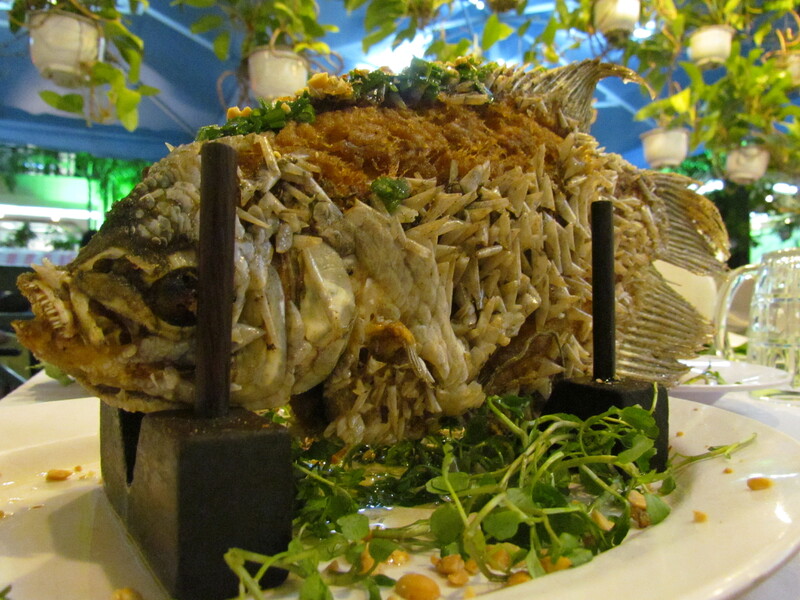 What came as a visual delight was a full fish. It was presented not in a lying down posture but a swimming posture!!!! This was then slowly cut & made into fish wraps for us. The wraps were ok to taste but the presentation was too wow. 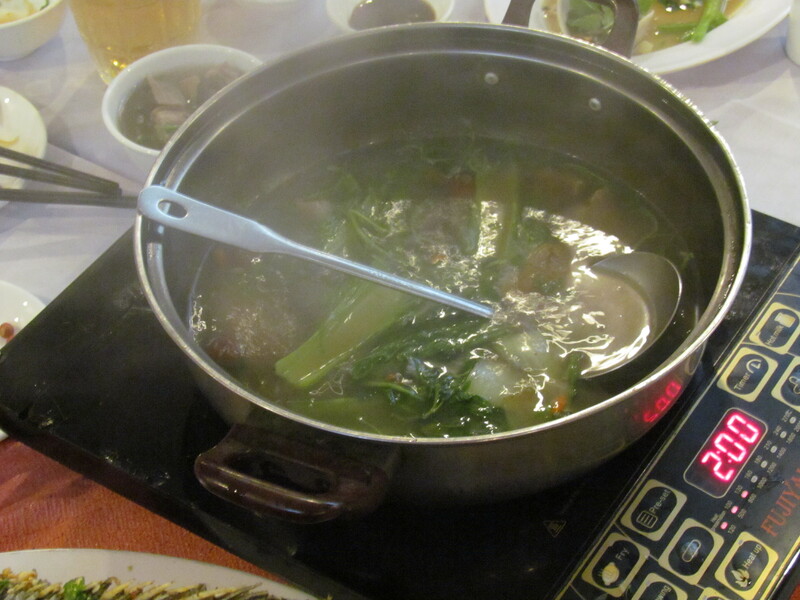 A soup was made right in front of us on the table – first came the electric stoves. Atop them were placed meat stock in containers & the soup was made & delivered fresh right in front of us – with fresh veggies & meats. Another amazing experience that I have not come across in India so far. Post this we were served the roasted baby pig (that we saw at the entrance). 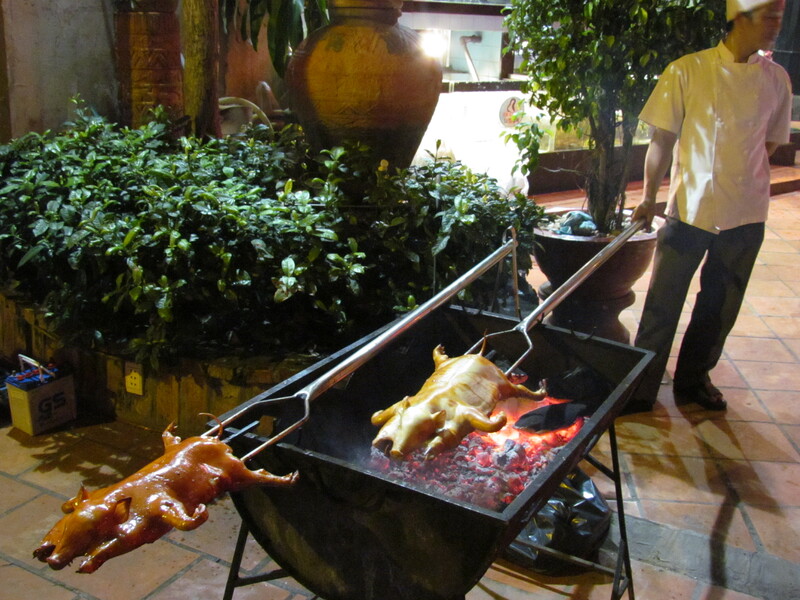 The way it was presented was again as if the full pig was right in front of u – just cut into smaller pieces. The snout, ears etc were all present. 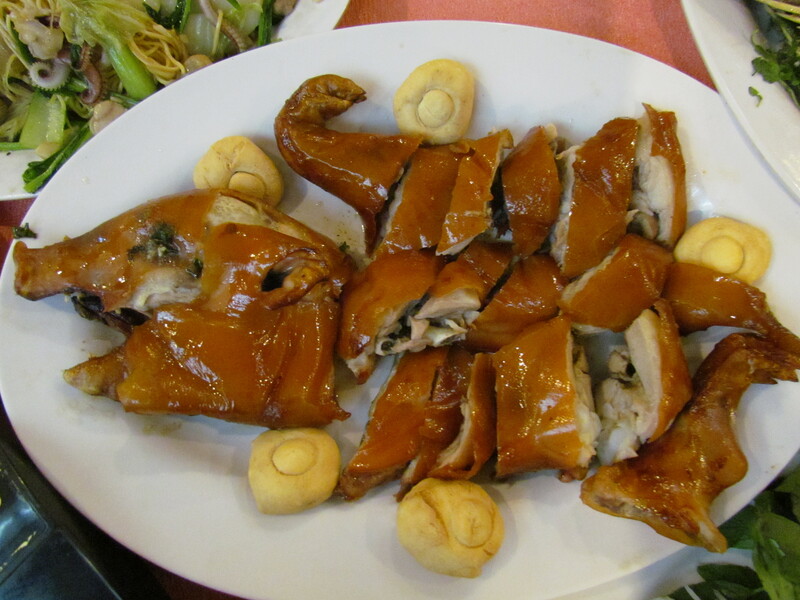 The way it was roasted was similar to Peking Duck – the meat was coated with sauces & then roasted. Thus, the outer layer was crisp & the inside was suuuuuuuuuper soft & unbelievably juicy. This is surely one of the most dramatic meat dishes I have had in the recent past. I do not imagine getting to eat this in India in quite a long time from now. Since all were quite full with this meal, we skipped dessert & instead washed off our mouths with our respective drinks. Vietnam food was an experience that I will remember for long & wud recommend all foodies to try & eat everything when in Vietnam. I am amazed at the effortless & simple way in which they churn out super tasty food. Hats off.